P & S S3-52-W 3-Gang Plastic Old Work Switch/Outlet Box w/Quick Click by Slater Plastic Boxes at N Online Agency. MPN: S3-52-W. Hurry! Limited time offer. Offer valid only while supplies last. 10 Pass & Seymour Slater S3-52-W gray Old Work 3-gang switch and outlet boxes. It comes with a quick/click and wall/bracket mounting for convenience. 10 Pass & Seymour Slater S3-52-W gray Old Work 3-gang switch and outlet boxes. It comes with a quick/click and wall/bracket mounting for convenience. It measures 5.875 Inch x 3.031 Inch x 3-3/4 Inch. It has swing bracket lines of 11/4 - 1/8 Inch. Box has six auto/clamps for each end to provide stability when large amount of force is applied. It has 52.000 cubic Inch capacity. 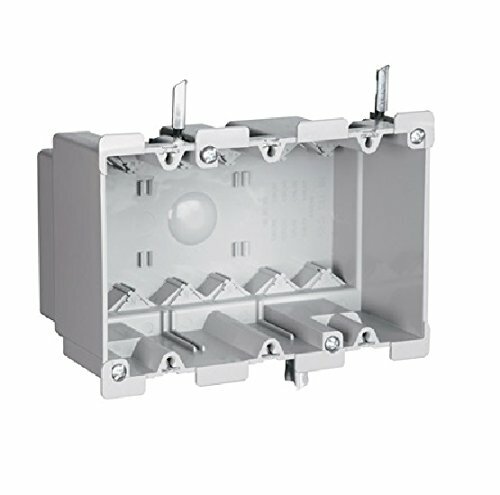 Switch and outlet box has flush insulation and a divider plate that is used when installing line and low-voltage devices/multiple 277 Volts devices in same box. Switch and outlet box is UL listed. Bulk packed loose in carton. If you have any questions about this product by Slater Plastic Boxes, contact us by completing and submitting the form below. If you are looking for a specif part number, please include it with your message.